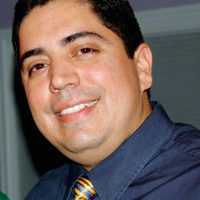 WASHINGTON — Martin Andrade, 40, is a security officer from Chicago and is originally from Michoacan, Mexico. He has been living in the U.S. legally for almost 30 years. Two years ago, his wife and mother of their two children was arrested and deported to Mexico. The children, ages 7 and 3, both U.S. citizens, are with their mother. Andrade said it could be up to 10 years before she’s allowed to return. Andrade visits his family once a year and talks on the phone with them almost daily about how he is fighting for their rights and their speedy return. He and over 150 other activists rallied on Capitol Hill, Sept. 12, hoping to put pressure on Congress to protect the rights of U.S.-citizen children and their hard-working, taxpaying families. “Immigrant rights are important because it’s the children, like mine, who have rights to live in their country with their parents,” added Andrade. Bertha Rangel, 26, met her husband Juan, a construction worker, 8 years ago. They have been married for six of those years and have three children ages 4, 3 and 1, all U.S. citizens. They lived happily in the U.S. for five years before Rangel’s husband was nabbed by immigration officials and deported to Mexico in 2005. Rangel and her three children traveled from Chicago to Washington to fight for the reunification of their family. “We are here today fighting for justice, so that Dad could come back home,” she told the World. “It’s been pretty tough — it’s hard for them to understand,” she said about her children when they ask why their father cannot be with them. Rangel said she is a “full-time mom and dad” to her children these days. Groups from California, Rhode Island, New York, Texas, Illinois and elsewhere met in Washington to rally support for the estimated 4 million to 5 million U.S.-citizen children threatened with having one or both parents deported for lack of documentation. Carrying a homemade banner that read, “Born in the USA, don’t take our moms and dads away,” 8-year-old Saul Arellano, son of Elvira Arellano and a U.S. citizen, marched through the House of Representatives’ Rayburn Office Building with other children whose families have been separated. Saul and his friends presented a letter to the office of House Speaker Nancy Pelosi (D-Calif.) asking her to urge Congress to stop immigration raids, deportations and the separation of families. Elvira Arellano spent a year in sanctuary at a Chicago church after challenging a deportation order in 2006, in order to remain with Saul. She had planned to speak in Washington, before she was arrested and deported to Mexico last month. Saul has spent the last year appearing at rallies across the U.S., on television and meeting with lawmakers. Recently, Saul toured 18 cities. Since then, he has reunited with his mother in Michoacan, Mexico, where he has started the third grade. Emma Lozano, an immigrant rights leader in Chicago, said Arellano is trying to get a visa in order to testify before the Hispanic Congressional Hearing on immigration, scheduled next month. Labor Council for Latin American Advancement (LCLAA) Executive Director Gabriela Lemus was a speaker at the Washington event. “Congress needs to take action,” she said. 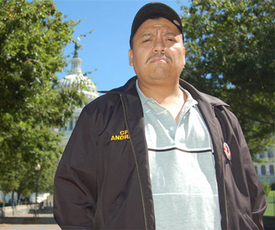 The Bush administration and Department of Homeland Security’s crackdown on undocumented workers, along with the employers who hire them, with the new “no-match” Social Security identification enforcement must stop, said Lemus, until the broken immigration system is settled. LCLAA is promoting voter education and registration, including leadership training and community development, in 15 states to ensure a sustainable Latino vote in the next elections, said Lemus. Luis Zepeda, 11, was one of the children who came from Chicago to Washington. “I’m here for my mom, who was deported, so she can get papers and come home,” he told the World. He said he misses his mother, who he has not seen in two years. He talks to her on the phone at least once a week. “I tell her I love her,” he said.